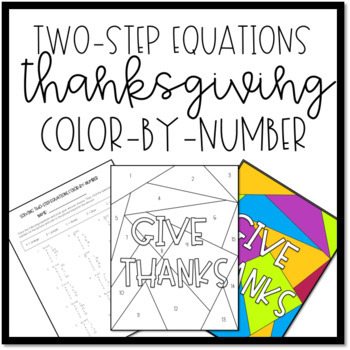 This engaging Thanksgiving color-by-number activity gives your students a chance to review or practice solving two-step equations! It can be difficult to engage students around the holidays--the weeks leading up to breaks can be stressful for teachers and students alike. Coloring has been shown to reduce stress, and it provides an outlet for students who love to be creative, so this color-by-number is the perfect blend of practice and self-care! Review for Algebra 1 students who need remediation or practice solving two-step equations. Practice for pre-algebra students who are learning how to solve two-step equations. Included in the download is the color-by-number activity, a work page for students to solve the equations, and an answer key. Looking for one-step equations Thanksgiving practice? Click here.